Forklift Classes – Start a Forklift Training Class! Independent research has shown that powered industrial truck (forklift) operators who have their forklift certification earn more than forklift drivers who do not have a certification. The good news is, it doesn’t have to take a lot of time or cost a lot of money to complete forklift classes and receive your certification. For a small investment of $59.95 and just two hours of your time, CertifyMe.net can provide you with the forklift training classes you need to be compliant with OSHA, qualify for better paying jobs, be safer on the job, and increase your annual salary. 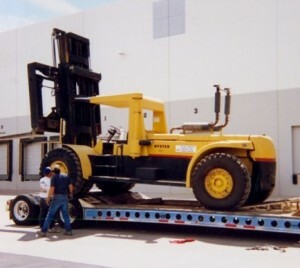 We specialize in initial forklift classes for brand new operators at CertifyMe.net. We offer a few separate new operator classes that specialize in the different types of forklifts. Forklifts are made differently for various tasks and require their own separate training for operators to be as prepared as possible. Students of our program can choose the specific type of forklift classes that correspond with their duties at work. This allows employers to only pay for the classes their workers need, and to skip the classes they don’t need. how to prevent injuries and fatalities. Each of our classes are compliant with OSHA, but that doesn’t mean that they require hours of your time. In fact, our online forklift training classes may be completed in about the same time it takes to watch a movie. Our forklift training classes are also available in both English and Spanish / Nuestros cursos de formación elevadoras están disponibles en Inglés y Español. When you’re ready to recertify, three-year re-certifications are always free! Class 1: Electric Motor Rider Trucks—this training involves electric sit down rider forklifts, and electric stand up rider counterbalanced forklifts. Class 4: Internal Combustion Engine Forklifts—Cushion Tires—this training covers gas or LPG sit down rider forklifts, and counterbalanced forklifts that are gas or LPG powered. Class 5: Internal Combustion Engine Forklifts—Pneumatic Tires—this training includes gas or LPG powered sit down rider forklifts and counterbalanced forklifts. Class 2: Electric Motor Narrow Aisle Forklifts—this training covers high lift straddle, order pickers, reach type outriggers, side loaders, turret forklifts, swing mast and convertible turret/stock pickers, low lift pallets, and platform forklifts. Class 3: Electric Motor Hand or Hand/Rider Forklifts—this training involves low lift platforms, low lift walkie pallets, reach type outriggers, high lift straddles, high lift counterbalanced lifts, and low lift walkie/ricer pallets. Class 7: Electric and Internal Combustion Engine Tractors—this training covers sit down rider lifts, rough terrain forklifts, straight mast forklifts, extended reach lifts, telescopic lifts, extended boom lifts, and straight mast rough terrain forklifts. Once you have completed one of these forklift classes and have passed the online forklift school test, your temporary certificate and operator card will be automatically printed along with a checklist for the hands-on evaluation for your employer or supervisor. The hands-on practical assessment is the next and final part of your new operator forklift training. This last part of the training will be led by a trained supervisor, and once you’ve completed this step, you’ll officially be certified and ready to operate forklifts. Once you choose the forklift course you need, your employer will register your company and you’ll be given online access with your own account. From any device with an internet connection, you will work through the training modules at your own pace. You will pass a test before you can move onto the in-person practical skills evaluation. Once your supervisor is ready to lead the evaluation, you will demonstrate your ability to drive a forklift in a safe environment. Don’t worry, your supervisor will perform these tasks first and walk you through each step. When you pass the skills evaluation, you’ll print your temporary operator certificate and will be ready to drive forklifts! It is required that operators renew their certification every three years to ensure they remain up-to-date on practices and safety protocols. When you complete your initial training with us, all of your three-year re-certifications are free. Forever! Are you an experienced forklift operator? Do you have OSHA-compliant forklift certification? Do you want to make yourself even more valuable to your employer? Why not sign up for CertifyMe.net’s Qualified Trainer/Evaluator forklift training classes! As a forklift trainer, you will be responsible for conducting the new operators’ practical assessment. Once they’ve finished their online training, you will lead them through a hands-on practical evaluation which teaches them how to actually drive the forklift. Our “Train the Trainer” forklift classes provide training in OSHA safety compliance and in hazard recognition. Who Is the Train the Trainer Class for? This training is suitable for shop foremen, safety officers, warehouse managers, supervisors, branch managers and even company owners. Cost: CertifyMe.net’s Qualified Trainer/Evaluator forklift class costs only $110 per trainer. The forklift training class is always accessible and may be completed during a long lunch break, before shift or at break time. The CertifyMe.net Train the Trainer forklift class is easy; anybody can do it! Learn more about how to get forklift certification. When it comes to starting a new career operating heavy machinery, your safety should be your top priority. Forklifts are large, heavy pieces of equipment that cause many accidents every year that result in severe injuries and fatalities. Hopping into a sit-down forklift is NOT just like driving a car, and doing so without training is a risk to your life. Forklift certification is the most successful way to be safe on the job and prevent accidents. Additionally, employers also want a safe workplace to avoid having to pay employee liabilities, for repairs to equipment and structural damage, and fines from OSHA. OSHA now has the authority to impose a $3,000 fine on an employer for every untrained forklift operator on the premises. This can escalate to $30,000 in the event of willful neglect. By taking the CertifyMe.net forklift certification class, you will increase your value to your employer by saving him thousands of dollars in OSHA fines. Hearing all of this, you may think that proper forklift training and certification won’t come easy for both aspiring operators and employers. However, it doesn’t have to be this way. Forklift classes do not have to be expensive or taken in-person at an outside training facility. To comply with OSHA requirements, you can complete your forklift training online in a way that is convenient and affordable for you. Skip the travel and traffic to an off-site facility. Train at home or at work! Enjoy total convenience and ease! You can clearly see how important forklift training is to your safety and the future of your career, but that doesn’t mean quality training needs to be inconvenient, expensive, and frustrating. With CertifyMe.net, you will complete an online program that delivers all of the content you need to operate a forklift safely and properly, recognize and avoid hazards, inspect the equipment, and learn efficient maneuvering techniques to be productive, all in about an hour! You will be saved the trip and expense of having to travel to an offsite facility and pay hundreds of dollars. Once you’re finished with our program, you’ll be able to immediately print your certificate and complete the in-person practical assessment with a supervisor at your job. Receive three-year renewal training for free, for life! To protect your life, save your employer money, and be the most productive and efficient as possible, choose the forklift training from CertifyMe.net. Contact us today to get started! OSHA itself does not approve, accredit or certify any forklift training classes, forklift trainers or forklift certification classes. The liability is on the employer to provide OSHA-compliant forklift classes. A qualified trainer is anyone who has a recognized certificate, degree or professional standing or who has demonstrated competence in training and evaluating powered industrial truck operators. By taking CertifyMe.net’s forklift certification class in training and evaluation, you can meet this requirement. You will be able to perform a hands-on forklift training class and evaluation. For more information on the forklift class offered by CertifyMe.net, contact us on 1-888-699-4800.